It’s a busy June morning in downtown Los Angeles. As expected, exit 20B on I-110 Southbound is an absolute mess, and as a sea of cameramen and camerawomen litter the streets – including the exit ramp itself – in an effort to get inside the Galen Center, host of the E3 2013 Xbox Media Briefing. bs angel, myself, and a small crew of 343’ers put up with the traffic for a bit, but eventually ditch our cab and join the on-foot procession down the exit ramp to attend the festivities as onlookers. We tuck ourselves into the nosebleeds of the USC arena with press and industry folk, the large majority of which aren’t aware that the first glimpse at the next Halo title will be shown within the next 90 minutes. You may have watched from home – and got the first look at what was then dubbed, both internally and externally, “Halo Xbox One.” Chief’s cloaked trek served as a confirmation that development of a Halo title for the Xbox One was indeed underway. When the Halo logo appeared on-screen, and the roar of fellow Halo fans erupted throughout the arena, I found myself with goosebumps, and I’d bet many of you did as well. Since that time over 2 years ago, the next Halo title has been built from the ground up, and in just a few days (approximately three, to be exact), Halo 5: Guardians will release to the world. 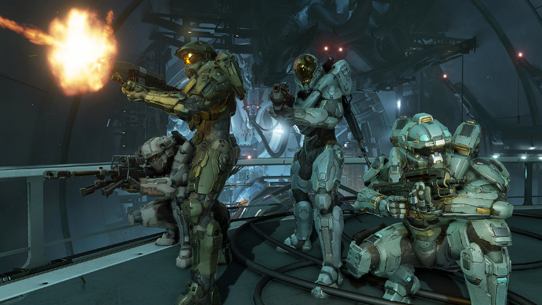 The development of Halo 5 can be best described as a journey, and one far different from previous Halo titles. From initial design specs and conversations that began before the launch of Halo 4, to the overwhelming amount of invaluable feedback and data we received from your time with the Multiplayer Beta, to next week’s launch, and what is yet to come, it is safe to say that while next Tuesday is when the fun begins, it is not the end. Instead, it is the exact moment when our paths on this journey come together. Your feedback has shaped this experience, and will continue to do so once the game is in your hands. We can’t wait to watch you play and hear your thoughts, and we’ll be right here playing with you, perfecting and tweaking, and building new things for you to play. Only one weekend separates you and Halo 5 launch night. Are you ready? Over the past few weeks, we’ve been keeping an eye on your launch night plans. Many of you are taking a day off of work, others are taking a week off, and some have abandoned their job and all other adult responsibilities entirely. 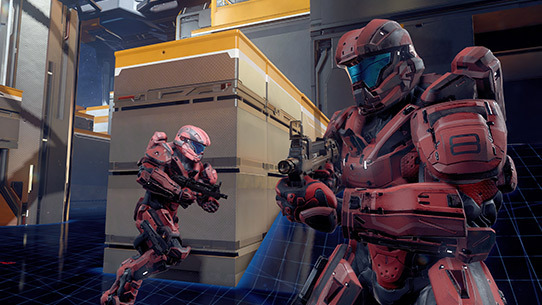 Whatever your plans might be, we recommended you make sure you have a screen of some sort nearby for Halo 5: LIVE. Read on for details. Halo 5: LIVE will feature live interviews with Phil Spencer, Bonnie, Josh, and Kiki, roundtable Halo story discussions, chats with many of our fine voice over artists, live check-ins with Halo celebrations around the globe, speedruns, map analysis, esports content, and more. Included in this “more” of course is the world premiere of first episode of Halo: The Fall of Reach – The Animated Series. We do hope you’ll join us for the show and celebrate with Halo fans all over the world on Monday night. We’ll see you then. And, if you’re nearby us, you’ll be seeing most of the Halo 5 team at the UVillage Microsoft store, where we’re bringing the BOOMCo Breakout Arena that we first showed off at San Diego Comic-Con. It was heavy, but we got it here, and it’s ready to go. Earlier this week, we revealed Spartan Companies, which give you and your legendary crew a HQ to call home. Whether the company is simply you and three long-time friends, or a group of dozens of members, Spartan Companies provide you with a private forum for scheduling game time and talking strategy, group messaging, custom emblems, and more. Additionally, you’ve probably noticed from early access streams that your Spartan Company name will appear in-game, just below your nameplate. We’ve started to see some great feedback and request for Spartan Company features, and know that you want even more from them. The team here has many great ideas for the future, and are looking forward to what you’d like to see from Spartan Companies, both in-game and on Waypoint. Be sure to let us know in the Spartan Companies forum section. To create a company, sign in and head here. Once you create or join a company with four members, you’ll also receive a complimentary REQ Pack in your Waypoint inbox. Open it up, grab your new cosmetic, and head over to Spartan Customization to try it on, and also try on other armors that you don’t yet have – but really want to have. We hope you enjoy grouping up with teammates and old friends in Spartan Companies, and stay tuned for what’s planned for the future. 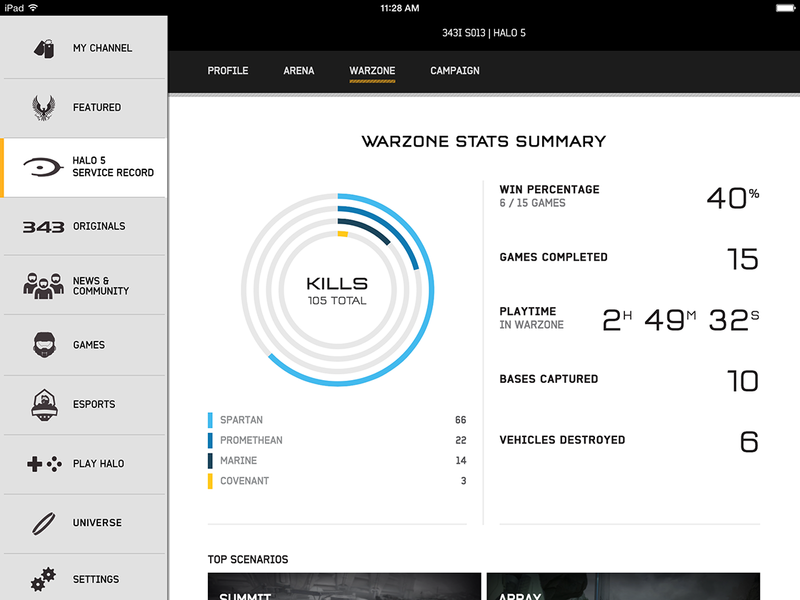 While the above stats apply to Warzone, you can expect a very similar experience for Arena and Campaign as well. You can see your total kills, as well as breakdown of how many kills you’ve accrued per enemy type. Remember, when you’re taking down enemy AI or other Spartans, everything you’re doing in Warzone helps bring your team closer to victory, and you’ll find a breakdown of it on this page. You’ll also be able to dive into stats for each match to view the complete Carnage Report which includes Kills, Assists, Boss Takedowns, etc. 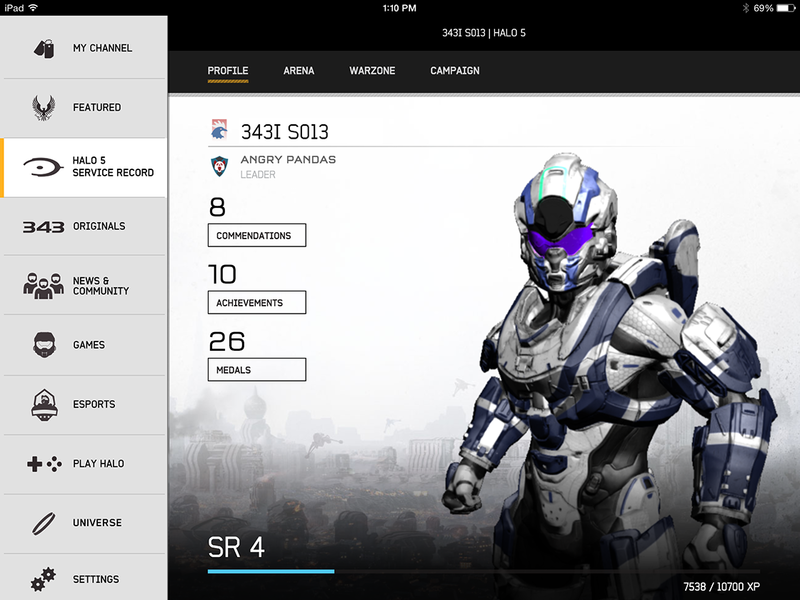 The Halo Channel mobile app is also receiving some more content to match the Xbox One app. With this update, you’ll be able to watch Halo: Nightfall on the go, and when it becomes available, Halo: The Fall of Reach – The Animated Series. Finally, the latest and greatest version of the Halo Channel app is now available on Windows Phone. Now Windows Phone fans can enjoy the wide variety of videos featured on Halo Channel including The Sprint, Red vs Blue, and HCS Updates in addition to the complete Halo 5: Guardians stats experience. In the Arena Stats Summary, you’ll see a link to your Spartan Company, Spartan Rank, win percentage, K/D ratio, headshots and assassinations, and also things like total playtime, games completed, and a record of your recent wins and losses. As you can see, Dersky is pretty good. 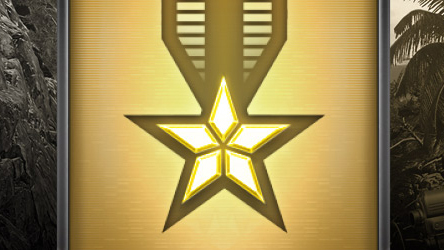 Each ranked Arena playlist will also feature a dedicated stats section, which will show your rank (or remaining placement matches), how close you are to the next rank, K/D for that playlist, and also games completed, wins, losses, and W/L percentage. You’ll also find stats by game type, which include stats for each game type in Arena. 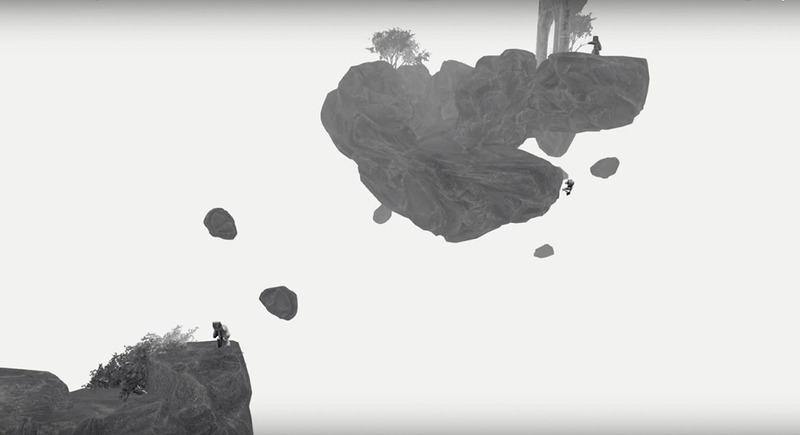 In the above example of CTF, you’ll find things like flag grabs, caps, and returns, and even total flag carry time and kills with flag. Also, you’ll find a breakdown of weapon and vehicle-specific stats. For the magnum, which is Dersky’s top weapon, you’ll see kills, shots landed, shots fired, accuracy, and total headshot count. Whether you’re jumping into campaign or multiplayer first on day 1, once you’ve dominated your domain, hop onto Waypoint to grab a statistical analysis of your efforts, admire your REQs, and set sights on new challenges, weapon skins, and more. For good reason, there are often times where we don’t let our Pro Team play against…anyone. For example, if there are small children or business executives visiting the studio, we do our best to ensure that they don’t have to play against Pro Team. Our veteran mix of professional talent have spent the last few years working on and perfecting Halo 5 multiplayer, day in and day out, and it is safe to say that their skills are to be feared. Now that the game is nearly here, though, we couldn’t resist an offer from our friends over at ESL and Philips, who are opening up a new 4v4 ladder to accept challengers. Next month, the top 5 European teams will face off against the 343 Pro Team for a chance to take home the new Philips UHD Ambilight TV as well as some serious bragging rights. To learn more, head here, and to sign up, head here. 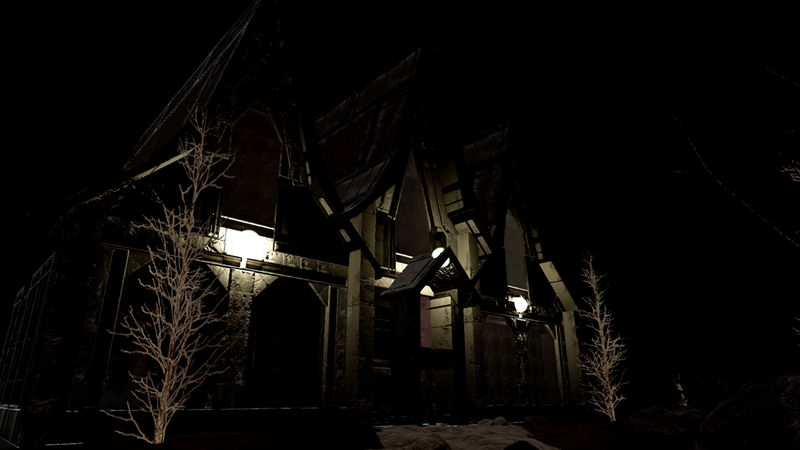 The Manor is as haunting as it is exquisite, laying down the foundation for both quality and subject matter of an aesthetically spooky themed contest. The viewer spawns in a foreboding misty grave yard with little to no visibility other than the distant lights emitting from the windows of a large manor up the hill. 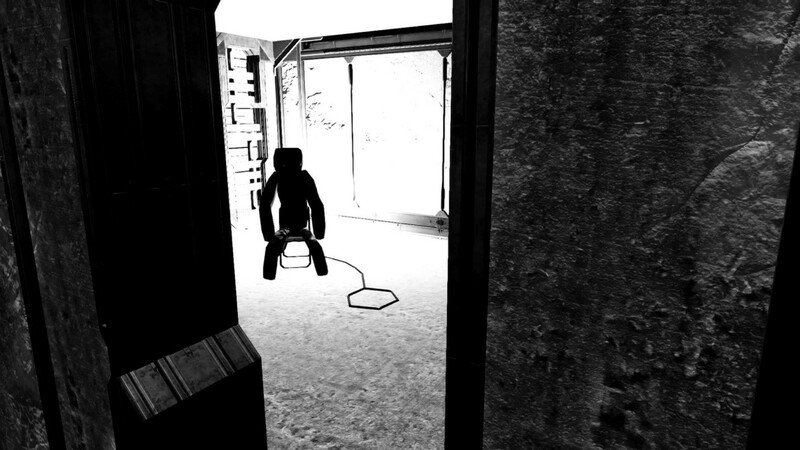 Make your way inside the house and explore further for more visual treats. The experience is traditional yet sensational as the execution and composition of this manor creates a landmark in the thematic definition of this contest. Was it a dream? chronicles the short adventure of a lone camper, who happens to stumble upon an eerie cavern portal which transports him to another dimension full of curios little beings. Though he's able to find his way back home, the lone camper begins to realize he may have not been the only thing to escape out from the dimension, leading him to beg the question. The ambiguous yet progressive storytelling came as a huge surprise as this was provided beyond the requirements for this contest. It’s great to see such artistic freedom and creativity challenge the nature of this contests guidelines. Crane Manor is a haunted house that when explored tells a visually compelling horror story in a very unique way. The stark silhouette of the manor cast against the gleaming bright lake both directs and encourages the viewer to progress forward. Once inside, each room in the house serves as a narrative chapter in the sequence of events that soon follow. Many visual tricks were used to accomplish these visual treats as each diorama uses numerous scripting elements to make the experience both interpretive and dynamic. Take time to engage with the visuals and hopefully you can come to your own conclusion as to what caused the melancholy that haunts this house. For download instructions, as well as a quick video tour of these haunted canvases, head over to ForgeHub. And with that, my friends, the final community update before the launch of Halo 5: Guardians comes to a close. With just a few days left, we prepare to turn the story over to you. We’ve done our best to get you ready for what lies ahead, and hope that you’re excited to jump in. Where we go from here, though, is just as much up to you as it is us. It is an exciting time indeed. We wish you a safe launch night that surrounds you with fellow Halo fans – whether it’s a pack of old friends at a launch party, or a night of gaming at home with a significant other. We’ll see you on Monday at 3PM PT / 6PM ET for Halo 5: LIVE.